Despite the rise of popular social hashtags like #wokeuplikethis, it's reported that between 50%-80% of all women wear cosmetics and that over her lifetime a woman will spend approximately $15,000 or more on cosmetics purchases. As part of the POPSUGAR Insights study "Beauty Evolved: How Millennial Women Shop for Beauty and Personal Care," we wanted to understand how often women are purchasing beauty products, how much they are spending, and from what types of stores they prefer to purchase. 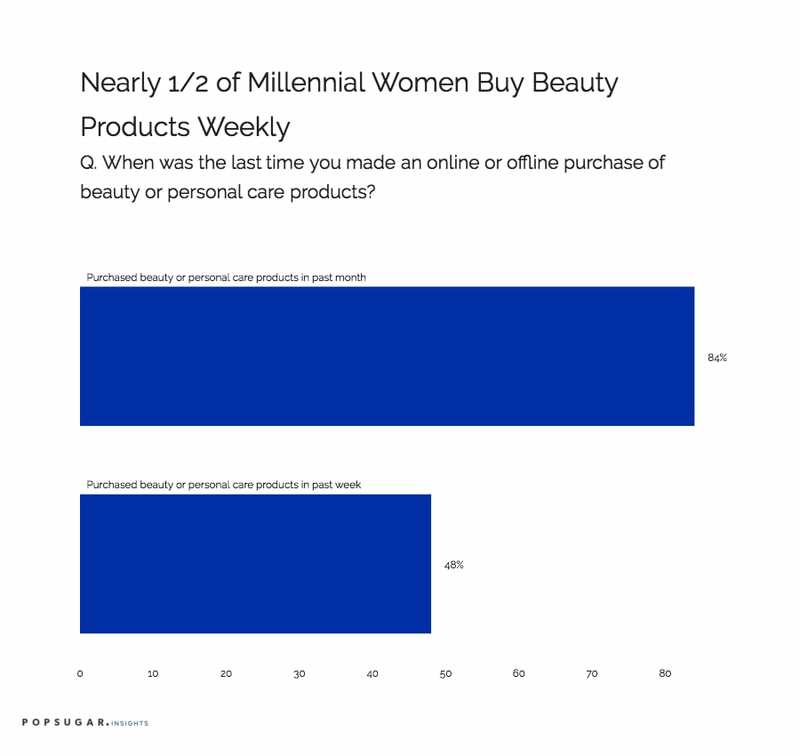 Over eight in 10 millennial women (84%) have purchased beauty or personal care products in the past month, and 48% have made a beauty or personal care purchase in the past week. Millennial women are only 5% more likely to have made an online or offline purchase in the past week and are 8% less likely to have made a purchase in the past month, so while the percentages for each segment are very high, millennial women are more likely to make more frequent purchases. Ninety-five percent of millennial women spend up to $150 per month on beauty and personal care products, with 43% spending between $50-$150 per month. Millennial women are only 3% more likely than women between the ages of 35-49 to spend between $50-$150 per month but 30% more likely to spend over $100 per month, making them a particularly attractive segment for beauty and personal care brands.